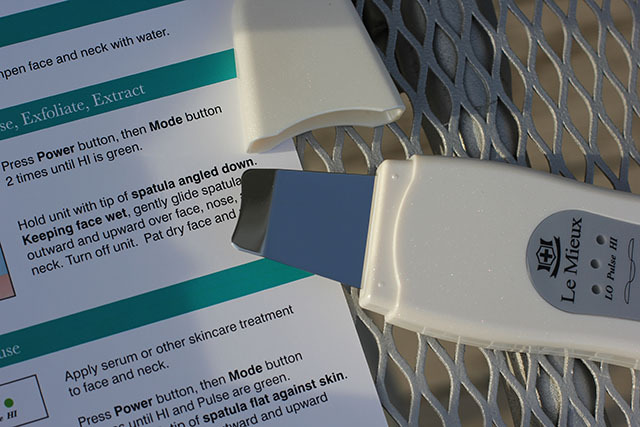 Today I have the coolest little skincare device to share with you. I don’t often accept reviews of skincare tools because they tend to be expensive and overpromise and undeliver. This one caught my eye because I haven’t seen anything like it. It’s by the company Le Mieux. 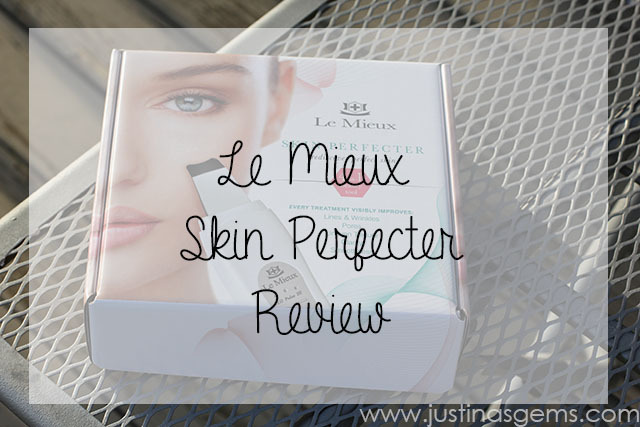 It used to be called the Facial Scrubber, but it’s just been rebranded for the consumer market and they’re calling the Le Mieux Skin Perfecter. It just premiered on QVC in May! As you can see by the box, it’s an ultrasonic beauty tool that combines four skin treatments into one- it cleanses, exfoliates, extracts, and infuses to reveal smoother, brighter, perfect-looking skin. Lines, wrinkles, pores, texture, clarity, and smoothness are supposed to be improved after every single treatment. The Skin Perfecter resonates at 28,000 vibrations per second. It’s meant to be used on wet skin, producing ultrasonic waves that pulverize the water, creating micronized particles that deep cleanse the pores of excess oil and impurities, exfoliate cellular debris, extract blackheads and whiteheads, reduce the look of enlarged pores, and resurface lines and wrinkles. 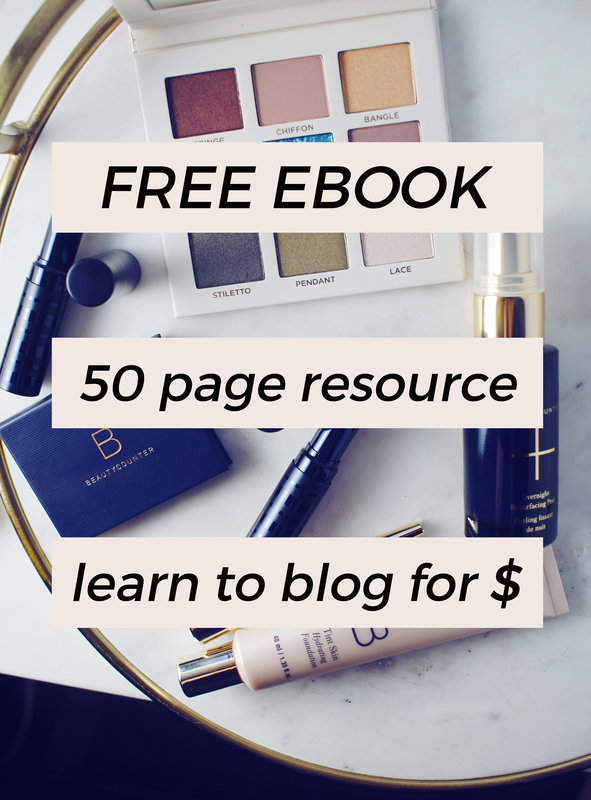 You can also use this tool to help accelerate the absorption of serums and other skincare products, which is more effective than massaging them in by hand. I’ll admit when I first tried this I couldn’t really see the hype. Videos I watched on YouTube showed steam coming off of the faces of the people using it. It wasn’t happening for me. I think the trick to this is to be sure your face is wet. Not just wet, but saturated with water. I had been wiping water on my face with a towel, but it was only getting my face damp and that wasn’t cutting it! I actually applied water to my face with a wet kleenex so that water was pooling up on my face and that was the ticket for me. This is not something to use in place of your cleanser- you’ll want to use it on clean skin, but I do think it made a difference in cleaning out my pores. Where I really saw the difference was in popping actual pimples with this! Now, I know that’s a skincare no no, but hear me out. 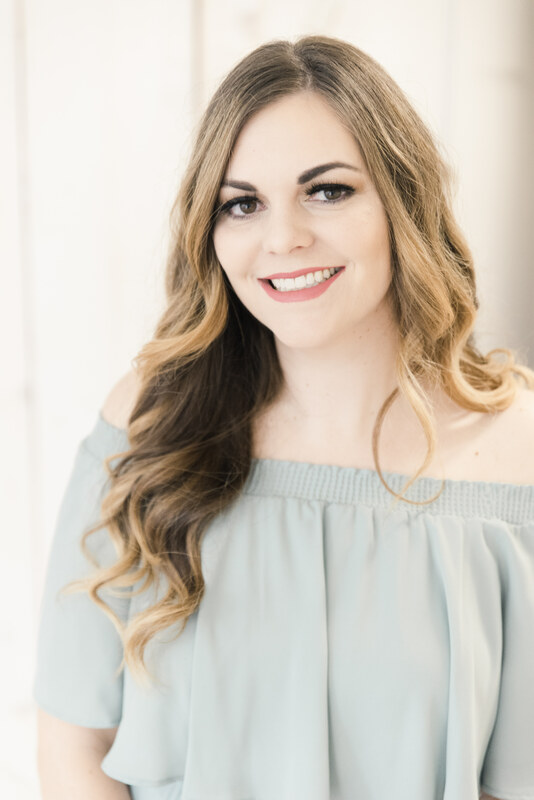 I was able to take the edge of the Skin Perfecter and glide it over a pimple, and even the smallest pimples that I am not normally able to pop because they are far too painful were popped with no pain at all! It was kind of amazing to me. I had my brother try it on his back where he had an absolutely terrible breakout. He had the same luck, gently gliding the tool over his pimples, and he was able to use this to get rid of them all. The breakout hasn’t returned! The Skin Perfecter is rechargeable, lightweight, portable, and never requires brushes, cartridges, or disks. It is super slim and would be perfect for travel. Using it is a breeze with the instructions- you just press power, then mode, until you are at the desired pulsating range. I used HI right away. This tool can be used 3 minutes 3 times a week! In a clinical study 100% of participants saw an improvement in skin exfoliation in two weeks. In a clinical study 85% of participants saw an improvement in overall skin appearance in two weeks. In a clinical study 80% of participants saw immediate improvement in brightness in two weeks. In a clinical study 69% of participants saw immediate improvement in radiance & luminosity in two weeks. In a clinical study 65% of participants saw an improvement of the appearance of pores in two weeks. In a clinical study 62% of participants saw immediate improvement in the appearance of skin texture & smoothness in two weeks. In a clinical study 50% of participants saw an improvement in fine lines & wrinkles in two weeks. In a clinical study the use of the Skin Perfecter improves absorption of serum compared to using ones hands. 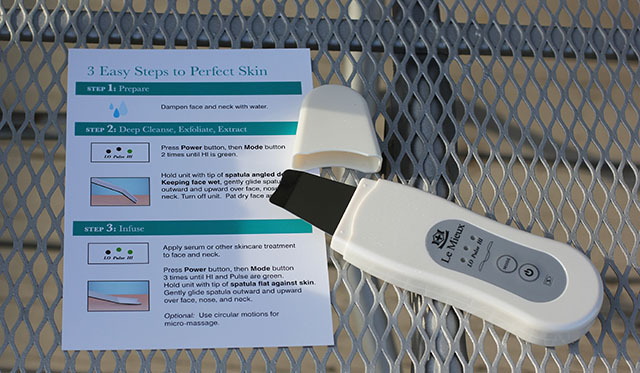 The Skin Perfecter is sold at skinperfecter.com, and at select salons and spas, and at the toll-free number 888.327.8188 . 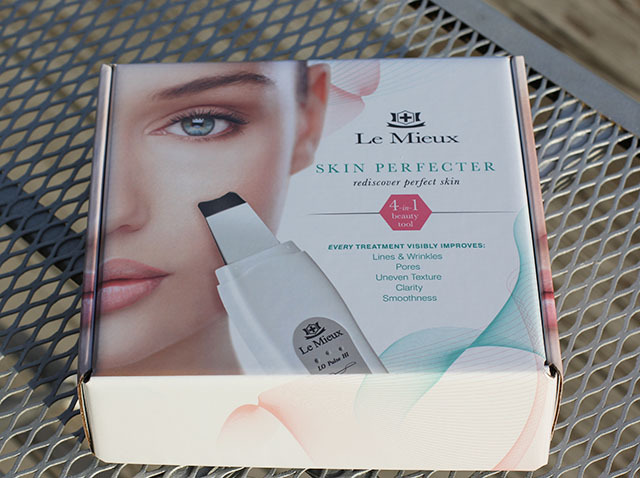 The Skin Perfecter will also make its debut on QVC on July 22nd, retailing at $225.00. Is this something you would splurge on? Tell me in the comments! While I like the idea of addressing different skincare issues, I am still a spa facials type of person and haven’t liked any of skin gadgets (even the Clarisonic didnt work for me). Sounds like a great product to try for safely clearing out that pesky acne. Fab review! Now this is right up my alley! I may have to look into this product more! This is very interesting product. I think I have to try it. I’ve always wanted to try something like this. Yup, I’m going to have to add another gadget to my collection. This sounds so cool to try! I’d be all over this if it wasn’t so pricey. Just to have it in my kit would be nice. It would end up paying for itself. I need this to pop my zit right now! I would love this for extracting.. but not at that price! I AM BUYING 1 OF THESE BUT MAYBE NOT THIS BRAND. I CURRENTLY OVERWHELMED WITHH THE TREMENDOU. # OF offers on ebay & amazon. With research background & my financial world turned inside out I can’t afford to make a mistake. Prices vary for “facial scrubber /peeler” starting at 30 – is to 1,200+ for products like a diamond pro micro derma brain machine with the scrubber inc as 1 of the tools. We need to know what is meant by “mini” sonic vs ultra sonic, cord or battery which the latter goes at about 9months….think the tool IS the battery so that would be the end of it for me! See the reviews on QVC ….get it from their custtomer service people. Phone number on website. In 2/15 it is back at the original price of 189 with up to 6 flex plays of $53-ish per month + your tax. PROBABLY SHIP ING COST. Search the net for 15% code for q’s time QVC V SHOPPERS OR A FREE SHIP ING COUPON. Feb ONLY !!! Also buy direct with no freebies at LeMieuxcosmetics.com. ASK for “Natalie.” Purchased many fab serums from her. All PHARMACEUTICAL GRADE. Egf/da and Booster wonderful. Get the Healing water…forgot the name and extend amount of time the products last. JUST WON BEST PEEL BY SPA PRO’s.online shopping NA, MUST CALL THEM IN CA. KOREA PRODUCTS—LOVE THAT! Scrubber made in America. I am NOT GOING TO BUYING ANY CHINESE SKIN TOOLS, SO THAT ANOTHER ONE OF MY RESEARCH ING POINTS. 1 year warranty not much of 1 UNLESS THE rumored 9 month battery life is true But be sure it’s not excluded from WARRANTY IF U HAVE ESTHER IAN LICENSE GET ME SOME STUFF!! Eye cream available to non-pros; also award winner! The “water” is healing quickly an injury I have which could cost me my leg. My Dr is major impressed! Off to do more resesrch…found it( looks like it) on ebay intl…Thailand I think. Sounds interesting, but the price is a little steep for my budget right now. I know what you mean about gadgets that underperform! This device sounds interesting and worth a try. The device looks really interesting but the price point is a little too much for me right now! I have tried something similar to this. I think it looks like a great product! this sounds like an interesting device. I’ve been using this too but not for extractions. How have u been using it? This sounds really nifty! I think QVC does a great job picking standout products to feature. This is pretty interesting. I need to go watch the YT videos. I saw this on QVC and decided to try it, mainly because it was on easy pay (you can make monthly payments) and because of their return policy. It’s great tool. I’ve been using it for 2 weeks now and I have noticed an improvement in my skin. I had a lot of congestion on my chin and it’s not as noticeable. It’s worth the money, I’ll save a ton on facials.